Santorini Island was formed by a violent volcanic event – this event happened about the time of the great plagues in Egypt. The Old Testament account of the many plagues leading up to the Exodus of the Jews – across the opening in the Red Sea is speculated by some archeologist to explain these events. Total Production 100 Pieces. Each watch is numbered. The Santorini manual wind, with a 2nd level Unitas 6498 movement. 17 jewels – adjusted. The case is 42mm x 11mm 314L stainless steel. Each is fitted with a genuine leather strap. I would like to pay in full. *Payment plan is valid for US orders only. Shown above: Santorini with a Jack Foster strap. d.freemont watches are timed just prior to shipping... a copy of the actual computer setting is included. Your name will appear on the print-out along with the serial number of the watch. Each watch comes in a gift bag with all warranty and papers. The Santorini uses an ETA movement which feature shock protected, 18,600 beats per hour movement. 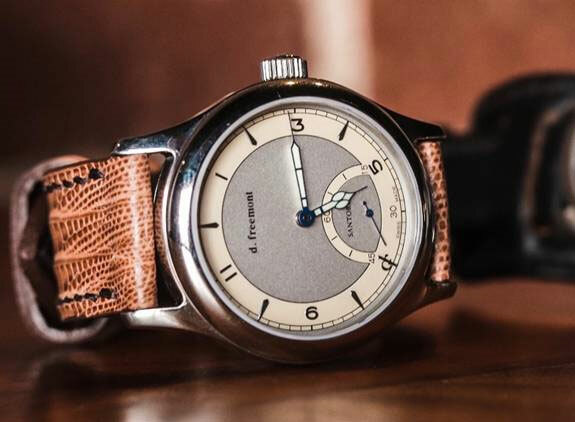 d.freemont Watches are truly collectible - limited production.